The project was conducted by the Danish Vejdirektoratet (project management) together with Transportøkonomisk institutt (Oslo) and Lärmkontor GmbH (Hamburg), who handled the manual. The ON-AIR project was financed by six European public road transport authorities. In the first part of ON-AIR a systematic analysis of the current planning practice in Europe took place. In addition, innovative ideas were identified and discussed in Hamburg at LÄRMKONTOR GmbH as part of a future workshop involving high-ranking European experts from road and environmental authorities as well as from consulting offices. 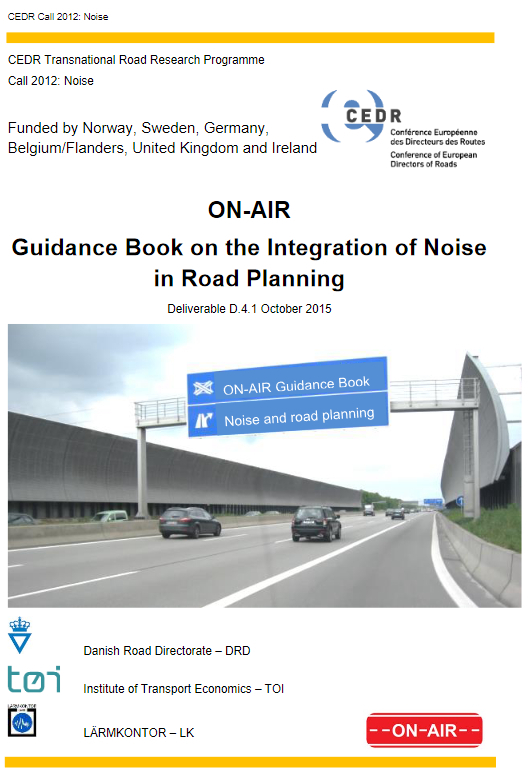 The manual provides tools for integrating approaches to noise reduction in different areas of road planning and maintenance. It contains a collection of over 30 illustrative – also interactive – practical examples.